A key appliance that the majority of households can't live without is the refrigerator. Shopping for a new refrigerator can be fun if you know what you need to look for and have a plan in place before you head to the store! Whether you are replacing an existing model or buying one for the first time, there is a lot to consider when choosing a refrigerator. In this Refrigerator Buying Guide, we cover everything you need to know, including the types of refrigerators, styling options, features to consider, and measuring your space. Discover all of the information you need in one convenient place. Enjoy! We know you'll learn a lot. In a Hurry? Check Out Our Video on Choosing the Perfect Refrigerator! One of the most basic questions to consider is what type of refrigerator you need. There are five main categories to consider, plus styling and design options that we'll outline below. This style of refrigerator is found in many small homes, older homes, and apartments, due to their smaller footprint and lower cost. They come in many sizes from 10 cubic feet to 24 cubic feet. In terms of dimensions, a top freezer refrigerator will tend to fit in a smaller space both in terms of height and width than many of the larger French door and side by side models that have become popular in the past few decades. They also tend to be slightly more energy efficient than comparable models in other styles by 10 to 25%. The largest top freezer refrigerators are around 24 cubic feet. 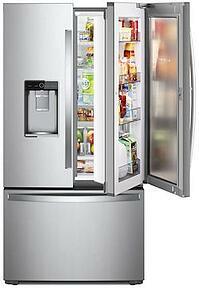 LG makes a 24 cubic foot model but most brands top out around 20 to 21 cubic feet in their top freezers. A bottom freezer refrigerator has the fresh food section on the top to allow better visibility and access to fresh food without the need for bending over. The freezer door - or freezer drawer, in this case - is at the bottom. These models are typically found in the 10 to 25 cubic foot range. These can be great for consumers that like to have their most frequently accessed fresh food items at eye level. A basic bottom freezer refrigerator will be about $100-200 more than a comparable top freezer model. French door refrigerators have taken the market by storm and they are especially popular in new home packages and kitchen remodels. They have two doors on the top for accessing the fresh food and a freezer drawer at the bottom. They come in many sizes, from 18 cubic feet to over 30 cubic feet, and are available with or without an icemaker accessible through the fresh food door. Side by side refrigerators are very stylish looking. They have the freezer on the left and the fresh food section on the right, split down the middle. They provide better access and visibility to the fresh food and better organization in the freezer section. They also are available with ice and water dispensers on the outside of the freezer door. The only drawback of this style is that the freezer sections are somewhat narrow, making it difficult to accommodate very large items. Side by side models typically range from 20 to 28 cubic feet. Most are 22-26 cubic feet. Compare French door vs side by side designs in our article, or check out the largest side by side refrigerator models! Built-in refrigerators are made to be built into an opening in the kitchen cabinets so they do not protrude from the cabinets. These high-end appliances do not have finished sides, and the compressor is usually located on the top of the unit. 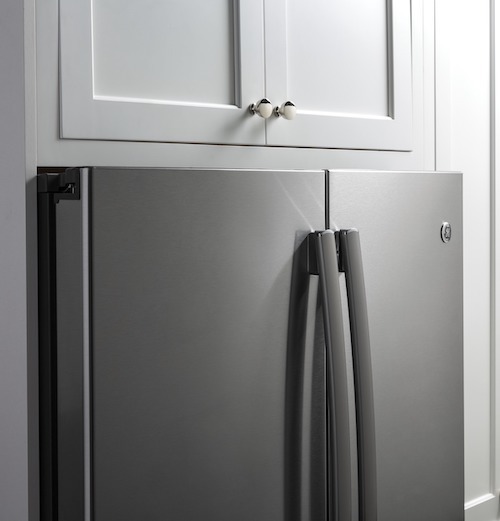 These are available in larger sizes and are usually priced much higher than freestanding refrigerators. Panel-ready refrigerators are similar to built-in models and are also a high-end option designed to have custom panels and hardware installed on the exterior for a seamless look that will blend in with your kitchen cabinets. Counter-depth refrigerators have a shallower depth than a typical refrigerator at about 24 to 25 inches plus 5 or so inches for the handles, so they don't stick out from the surrounding cabinetry. These models tend to be wider to make up for the decrease in depth and are another way to achieve a high-end look in your kitchen. They are more expensive than non-counter depth models. Another styling consideration is hardware. Some homeowners are very particular about having a complete suite of appliances with matching handles. All manufacturers, including their sub-brands, have distinctive handles - for example, KitchenAid's handles are vastly different from those of the Frigidaire Gallery line. And, of course, appliance colors! We're used to seeing traditional white and black, and stainless steel has been the premium go-to for years. However, new style trends are on the rise that you may want to consider, such as black stainless steel and GE's Slate, and Whirlpool Sunset Bronze. You may also want to consider smudgeproof stainless steel, which is available from many manufacturers. It's important to know how much space you have to work with in your kitchen when choosing the refrigerator size you need. If you are placing a refrigerator in a designated built-in compartment in your cabinetry, you'll have to measure the height, width, and depth. You'll also want to measure the distance to any obstructions that could impede the door swing, like doorways or kitchen islands. This will also help you consider how the refrigerator will look in your space and how the door swing will affect the "flow" of your kitchen. Many smaller top freezer refrigerator models will fit in spaces less than 30" in width, as will some single door bottom freezer models. 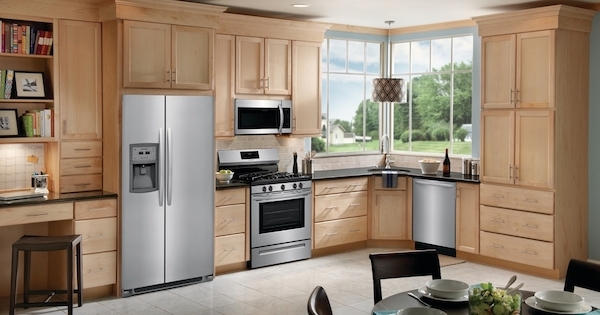 Most side by side refrigerators and French door models are designed to fit either a 33" or 36" space. These are the two standard spaces for modern kitchen design. Heights vary, so measuring available height is important as well - especially if your refrigerator compartment has cupboards above the refrigerator. Pictured below is an example of a full depth refrigerator in a counter depth cabinet vs a counter depth model in a counter depth cabinet to show the importance of measuring! As mentioned above in the styling section, counter depth vs full depth is another consideration. Counter depth models have a 24" deep case and are designed so that only the doors stick out beyond standard cabinetry and countertop depths. 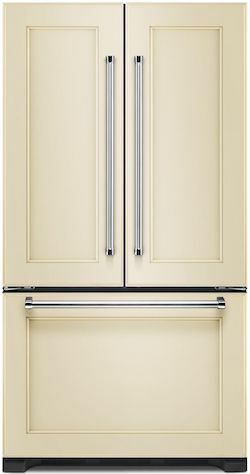 These are very popular in French door and side by side models, and single door bottom freezer models to a lesser extent. If you have a counter depth space and purchase one of these, it will look great. The one drawback is that you will sacrifice size compared to a full depth refrigerator of equal width and height. A full depth model installed in a counter depth opening will be less aesthetically pleasing for sure. Something consumers often overlook is measuring doorway openings. If the refrigerator will fit in the kitchen space but not through a doorway in your home, it won't be a good match for you! Be sure to closely measure the kitchen opening and all doorways. Key Features to Consider - What Are Your Must-Haves? There are many options here. Some refrigerators simply have an ice maker in the freezer section for on-demand ice, but no dispensing system and no water available. Many other models have filtered ice and water located in the door, giving you access from the outside. Still others have water dispensers inside of the fresh food compartment so that the exterior maintains a sleek, smooth look. If you are considering purchasing a refrigerator with ice and water dispensers or an ice maker in the freezer, make sure that you have access to a cold water line or are able to install one. If you have an ice maker in your current refrigerator, make sure the water line is in good condition if you intend to reuse it. If not, arrange to have a new one installed by a licensed professional. Read more about refrigerator ice and water dispensers in our article! Using dual evaporators - one for the freezer and one for the refrigerator section - increases climate control and temperature management in both compartments, keeping food fresher. They help eliminate temperature imbalances. For example, in a single evaporator model, if a fresh food door is left open frequently for long periods, the freezer may run at a colder than normal temperature and "over-freeze" the frozen foods as the single evaporator pushes additional cold air throughout both compartments to help stabilize the temperature in the fresh food compartment. Dual evaporators mitigate these issues. Looking for a cutting-edge design in a new refrigerator that could save you time, effort, and electricity? 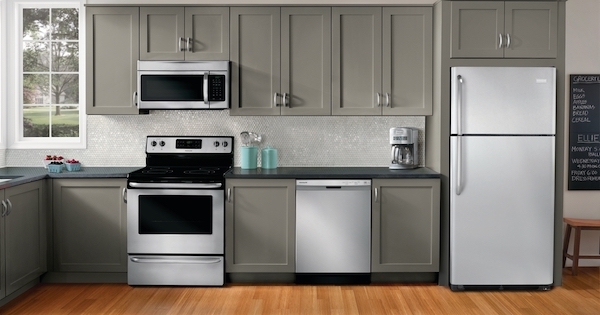 Check out four-door refrigerators! Four door refrigerators are like French door refrigerators but with the addition of a second drawer, which is usually for fresh food storage above the freezer door. This space can be very useful to you if you want to have a separate space for keeping certain foods at a different temperature or storing drinks and other snacks for the kids, so they can simply open the drawer and grab what they need without opening the large main doors. Other models split the freezer section vertically in half, such as the Samsung RF28K9070SR. A door in door refrigerator is another cutting-edge design feature. These models allow you to open just the outside section of the righthand fresh food door, allowing you to access frequently used items while keeping more cold air inside the refrigerator, where it belongs. This can be a great place to store items like sodas, juice, bottled water, and snacks, and other items that are accessed on a daily basis. Check out the article linked at the beginning of the paragraph for examples of several door in door designs from different brands! Be sure to take a close look at the interior layout of your refrigerator as well. Refrigerator shelving comes in different materials and layouts. Lower-end models have wire shelves, whereas you'll find glass shelves on most higher-end models. The number and location of the shelves and the available configurations are important to consider. You'll also want to take account of any storage bins, the size and layout of the door compartments, and the temperature controls of the bins. Connected appliances are all the rage! Many manufacturers offer smart refrigerators. LG has refrigerator models that can check food expiration dates and connect you to your refrigerator while you're at the grocery store. GE's wifi connected appliances leverage the virtual assistant Amazon Alexa and provide powerful features for consumers. 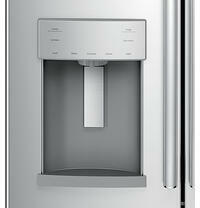 Samsung's Family Hub refrigerator is pictured below. 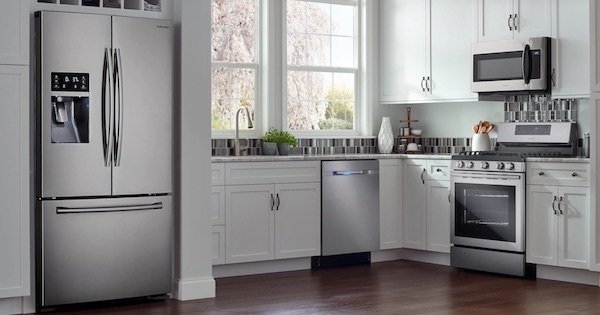 Recently, Whirlpool also rolled out a full offering of connected models (find out more about Whirlpool connected appliances in our article). A salesperson can help you figure out whether these cool features will fit with your lifestyle. The most inexpensive full-size refrigerators start in the $500 to $600 range. These are the most basic models, and are typically top freezer refrigerators with wire shelving. They're a great choice if you just want to keep your food cold with no frills. Check out Hotpoint refrigerators for great top freezer options, or consider value brand Amana for bottom freezer and side by side models. There are many full-featured models within the $900 to $1,500 range. Larger models with more features can run from $1,500 to $4,500, and built-in models can reach $10,000 and above. The up-charge on a counter depth model can be as low as $100. The price range you'll fall into will depend largely on the features you seek, and, to a lesser extent, the size of refrigerator you need. If you're planning to replace multiple kitchen appliances at once or buy a full kitchen suite for a new home construction or top-to-bottom kitchen remodel, you may want to consider appliance packages as a way to save money on your purchase. 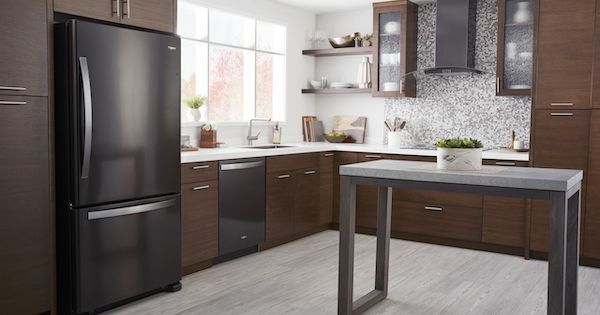 This is especially handy if you want a fully matched look - as we mentioned above, each brand uses distinctive hardware for their refrigerators, and colors like black stainless steel look different depending on the brand. 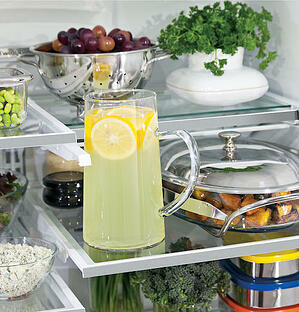 Another way to save money on a new refrigerator is to take advantage of appliance rebates. 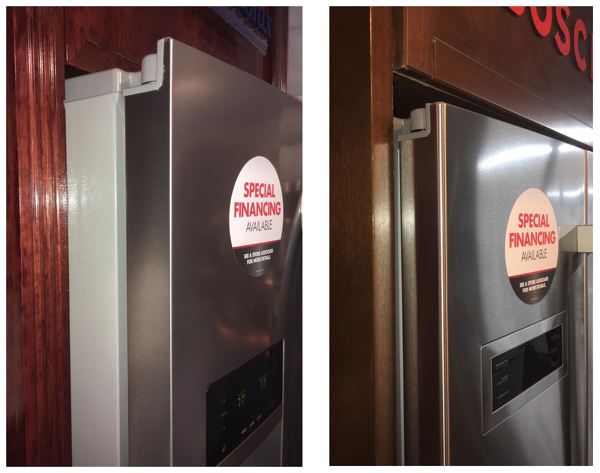 Brands will offer you discounts on the product itself or on delivery and installation for things like buying several appliances at once or purchasing an extended warranty, A rebate may also be available for recycling old refrigerators - use the Energy Star rebate center to see if this is an option in your area! And check out these tips on finding a program to recycle your old refrigerator, too! We hope our refrigerator buying guide was helpful on your journey to buying a new refrigerator. We'll use some handy bullet points to summarize all of the things we went over in case you're feeling a little overwhelmed! Have a plan in place for how you will dispose of your old refrigerator, if needed - many appliance retailers offer services to pick up and recycle your old model! If you're getting close to buying a new model, you might be worrying about the delivery and installation process. What should you do to prepare your old refrigerator, for example? We created a (free) New Refrigerator Checklist to walk you through each step of the process - click below to download! 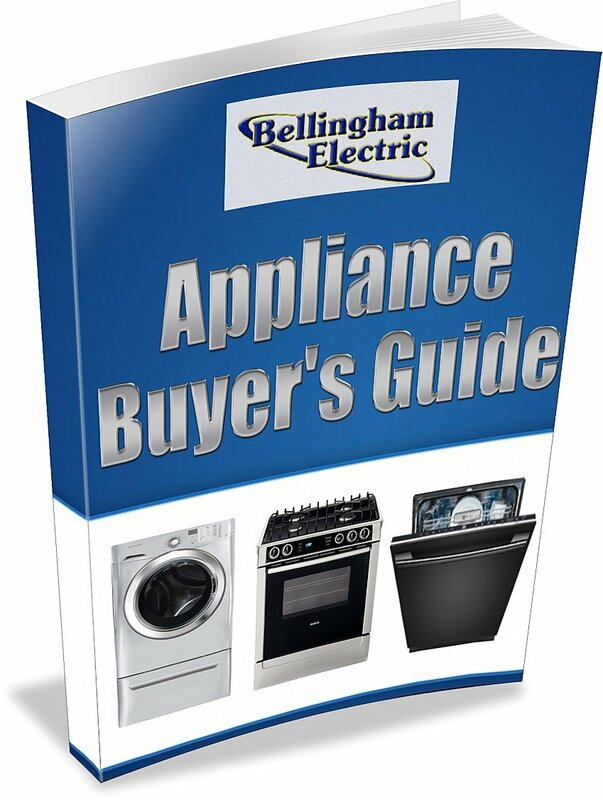 Click here to download any of our Buyer's Guides on various product types. These illustrated guides are 20 to 30 pages in length and packed with great tips!